It’s not easy being green…or so sang Kermit the Frog. It is easy though, to identify the frogs that you encounter while you’re out looking for birds that you can’t find. And while this blog is a birding blog, blogging about just birds in July is impossible because the birds are busy avoiding the blazing sun. So it’s frog time! I have five species of frog to share with you today, all native New Yorkers. 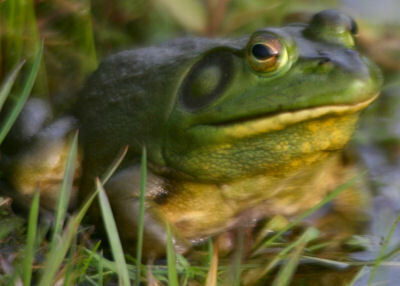 The first frog I’ll bring up is one of the easiest and most common, the American Bullfrog (Rana catesbeina). Though it may sound like a drunkard demanding more drink when it calls out a deep, resonating “Jug o’ Rum” it is not actually requesting booze but trying to attract the females. Though after seeing what the female frogs look like you can’t really help wondering if maybe the male frogs are demanding rum. Either way, the result of Bullfrog relations is tadpoles that actually take two years to become frogs, though they look pretty froggish even as tadpoles. If you see a big frog (biggest in North America) with green to yellow coloration and a lighter belly it is most likely a Bullfrog. Frog number two has a call that sounds like the twang of a banjo and an incredibly uninventive name. 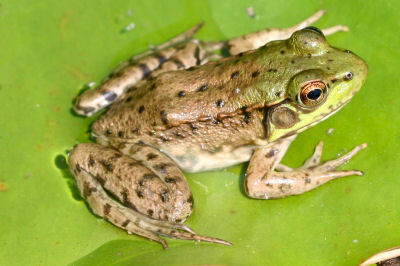 The, wait for it, Green Frog (Rana clamitans), is common across the eastern United States and Canada and is readily identified by its large tympanic membrane (the round thing behind their eyes that frogs use to hear) and prominent dorsolateral ridges. Check out those dorsolateral ridges! Mink Frogs (Rana septentrionalis) are a northern species, found in the United States only in Wisconsin, Minnesota, northern Michigan and upstate New York. 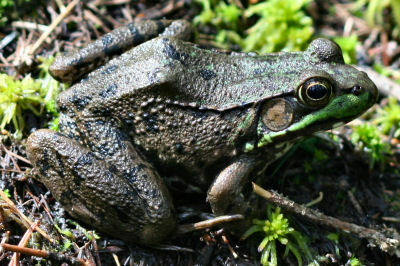 Their breeding is late compared to other North American frogs, with most eggs being laid in June and July. If you are in a northern bog and see a dark frog with a paler green color on the lower part of its face it is most likely a Mink Frog [Correction, thanks to commenter “A” and confirmed by Nick: if you see a frog like that without striping on its legs you likely have a Mink Frog]. If you want to see an actual Mink Frog, check out Nick’s post. 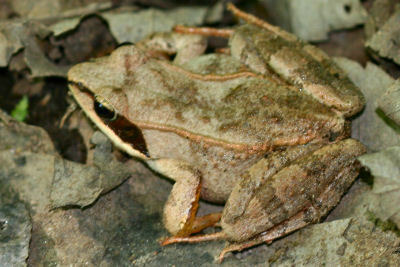 The frog with the dark stripe that runs from the eye to the ear drum is the Wood Frog (Rana sylvatica). As its name suggests, it prefers moist woodlands, though, like other frogs, it lays its eggs in water. There really is no mistaking this frog for other species in North America. 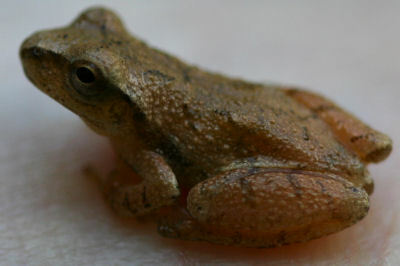 The Northern Spring Peeper‘s (Pseudacris crucifer) single note calls are a harbinger of spring. These tiny frogs that max out at an inch and a half have voices that outsize their bodies. Their small size, the “X” that is present on their backs, and their consistent calling in spring are their best field marks. The tadpoles of Northern Spring Peepers become fully sized adult frogs by August at the latest. So when the birds are quiet and you don’t feel like studying bugs take some time to look in puddles, ponds, streams, and marshes. 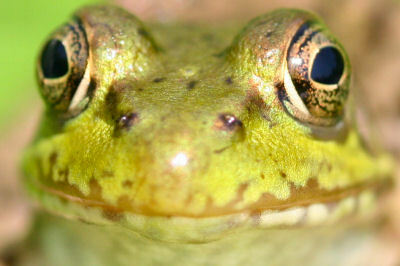 You will be wonderfully entertained by the wide variety of frogs you can find and identify. And who knows, if you kiss enough of them, maybe you will find a prince or princess! We spent the weekend at Hasty Brook- our place up north in Minnesota, and while birds were absent in the hot part of the day, insects were very active and frogs were thick down by the creek. Our insect and frog/reptile field guides were well used. There is always something to see! Sorry, that is most likely a green frog not a mink frog. The pattern on the leg is wrong. @A: After some further research, and an assist from the herpetological go-to guy for 10,000 Birds I agree…the frog is a Green Frog.